While the new Indo-Pacific construct continues to grab headlines, India's recent diplomatic orientation points to a renewed appreciation of what American strategist Zbigniew Brzezinski called the world’s “decisive geopolitical chessboard”: Eurasia. In order to grasp the significance of this strategic space, it is useful to compare it with the dynamics of the Indo-Pacific. The Indo-Pacific is a union of two maritime geographies, shaped for several decades by American presence and its grand strategy. This arrangement is now being challenged by the rise of China, with New Delhi seeking to carve out a new alignment of likeminded countries to sustain an order beneficial to its interests. Eurasia, on the other hand, is the intersection of two continental and normative spaces: Europe and Asia. Russia is the archetypal Eurasian power; its foreign policy is shaped in equal measure by the ever-changing dynamics of both Asia and Europe, and balanced by the North Atlantic Treaty Organization. As in the Indo-Pacific, this region is also seeing new engagements spurred by China’s Belt and Road Initiative. Given this state of affairs, India renewed interest in Eurasia and its engagement with Moscow acquires further salience. Between these two regions, however, lies a predicament for India’s foreign policy. Even as Delhi partners with the Washington in the Indo-Pacific, the relationship breaks down in Eurasia due to key differences on the assessment of security dynamics in the region, especially in the context of India’s co-operation with Iran and Moscow. 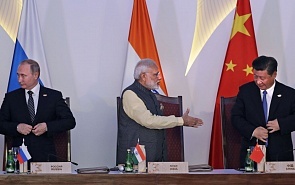 On the other hand, India’s engagement with Eurasia is further complicated by Moscow’s partnership on connectivity projects with Beijing and an emerging Indo-Pacific nexus between the two states. The situation is not unlike Britain’s dilemma in the late 19th century, when London sought cooperation with France to meet the continental challenge of Germany and preserve the balance of power in Europe, but opposed French efforts to assert maritime dominance in Asia. But all comparisons should end there -the first signs of British decline were evident then, and thus London’s options were limited. India, on the other hand, is ascendant. Nevertheless, these complex triangular relationships add tension and uncertainty to the India-Russia bilateral, given that the Indo-Pacific and Eurasia are not neatly segregated strategic theatres. Partnering with Washington in the seas and with Russia on the continent is, to put it mildly, a delicate balancing act for any country. However, two realities suggest that such a state of affairs will continue to co-exist for India. For one thing, India is a rising economic power; with estimates suggesting that it will become the world’s second largest economy in PPP terms in the 2040’s. The fact remains that a $1.6 trillion Russian economy simply cannot provide New Delhi with the investment opportunities and commercial partnerships that it requires. Washington, on the other hand, is a dynamic and global economy, well placed to facilitate India’s rise with finance and technology. America’s long standing naval presence and partnerships in the Indo-Pacific also assist India’s integration and capacity for leadership in the regional order. Second, Delhi cannot afford this entente with Washington to compromise its security relationship with Moscow. Indeed, India is well aware that no other country will assist in building its defence capability to the extent that Russia is already doing, whether it is the lease of a nuclear-powered submarine; co-development of missile systems such as the Brahmos; or the sale of the S-400 missile defence systems. Ultimately, India will go ahead with these deals despite the threat of US sanctions because it must prioritize its security interests over American goodwill. In Eurasia, these realities make matters difficult. Engagement with Moscow remains critical if India is to respond to intractable conflicts in Afghanistan, persistent security risks in the Middle East and Central Asia, and China’s steady westwards expansion. Such a partnership may also help prevent the Shanghai Cooperation Organization from becoming a de-facto police force for China’s Belt and Road Initiative; instead giving the forum a more legitimate and plural voice on Eurasian conversations on connectivity, finance, security and development. Having said that, Russia’s ‘axis of convenience’ with China is more an axis of dependency; Beijing is the only country capable of sheltering Moscow from American pressure. Politically or economically, India cannot do the same—leaving Moscow with few options. And while Washington has displayed some flexibility in willing to exempt India’s defence purchases from sanctions, America’s security priorities in Eurasia are entrenched—and hostility to Russia runs deep in its foreign policy establishment. It is not fully clear yet what Washington’s red-lines are for India. Increasingly, New Delhi is walking a tightrope between the political realities of Eurasia and the Indo-Pacific. In the Indo-Pacific, geographical, economic and political vectors are far more favourable to India. Eurasia is a fundamentally different proposition, and India’s pivot will rest on the strength of its bilateral with Moscow. New Delhi must assess its interests in the region, communicate mutually acceptable leeway on partnerships, and re-imagine the Russia relationship for the better part for the 21st century.